Last week, Facebook launched the Messenger Platform (beta), a platform that allows developers to build interactive ChatBots to communicate with over 900 million monthly Facebook Messenger users on behalf of any Facebook Page (brand, business or cause). 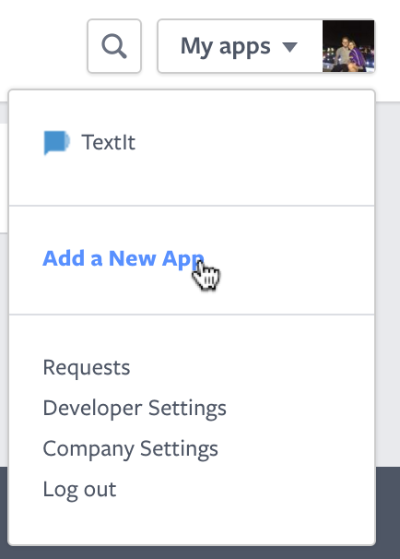 This week, we released a Facebook Messenger channel that will allow you to leverage TextIt’s visual, drag-and-drop interface to build and deploy your own Messenger Bot. Each Bot will map to a single TextIt account. Build just one Bot, and your experience is available on all platforms where Messenger exists, including iOS, Android, and the Web. Bots on Messenger will have the same functionality as anything you’d normally build with TextIt, like weather and traffic updates, and receipts, shipping notifications, and live automated messages. Contextual, convenient, and delightful. Facebook is focused on facilitating lightweight, convenient business-to-consumer interactions that provide meaningful value—a cause that aligns with our own. We’ve always advocated for SMS and voice (IVR). They’re among the most effective communication channels in today's mobile-centric world. That being said, web-based IP messaging channels appear to be the next step in the evolution of mobile interaction and we’re bullish on their future. Use this guide to submit a Messenger app for review and connect it to your TextIt account. Facebook requires each new Bot to be submitted for review. Before beginning this process, login to your TextIt account to build your Bot. This is an important step, as Facebook recommends submitting a video depicting an interaction with your Bot. Login to your TextIt account to use the following links to access specific pages in your account. a Facebook App: Your Facebook App will contain your Bot’s Messenger settings. This is where you'll setup your Webhook, retrieve your page access token and submit your app for approval. a Facebook Page: A Facebook Page will be act as your Bot’s identity. When people chat with your Bot, they’ll see the Page’s name and profile pic. a WebHook URL: Facebook uses secure callbacks to send messaging events to your TextIt account. 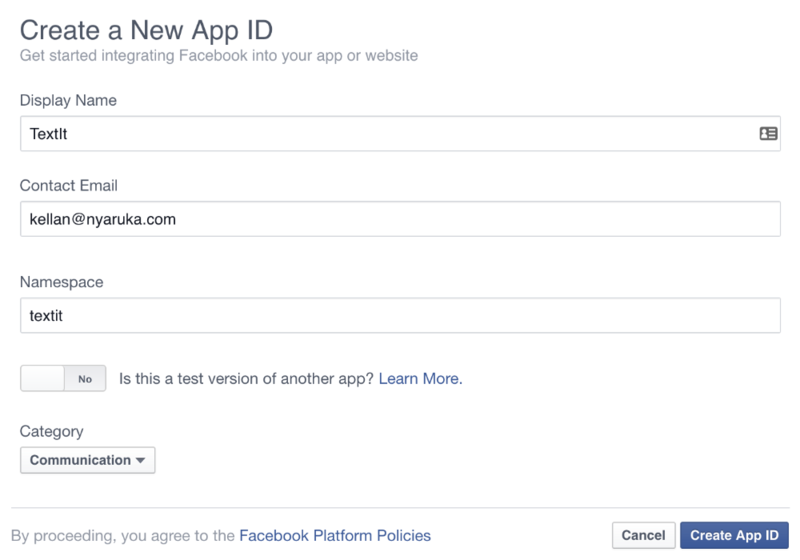 First, create an account on Facebook's Developer Platform. Once logged in, use the ‘My Apps’ menu in the top righthand corner to select ‘Add a New App’. An ‘Add a New App’ dialogue will appear, asking you to select a platform. Click the ‘basic setup’ link near the bottom; you can add your platform at a later step. Next, you’ll be prompted to create an App ID for your new app. Once you've registered your app, navigate to the ‘Messenger’ tab and click ‘Get Started’. At this point, you’ll need to generate a Page Access Token. If you already own a Page, you’ll be able to select it from a drop-down menu. If you don’t, a link will be provided to create a new one. Once you’ve received your Page Access Token, navigate to your TextIt account in a separate tab and claim a Facebook channel. Enter your Page Access Token to receive your callback URL. ‘messaging_optins’ subscribes your app to authentication callbacks via the Send-to-Messenger Plugin. ‘messages’ allows your app receive text messages or messages with attachments (image, video, audio). ‘message_deliveries’ subscribes your app to message delivery receipts. ‘messaging_postbacks’ subscribes to post back callbacks, in case your app incorporates buttons. Within the same section, select the page whose events you'd like the webhook to subscribe to. Next, navigate to the ‘Settings’ tab and click ‘Add Platform’. Here, you can add the URL of your website as your platform. Once added, click ‘Save Changes’ to continue. Prior to submission, navigate to the ‘App Details’ tab and complete it. Now you’re ready to submit your app. 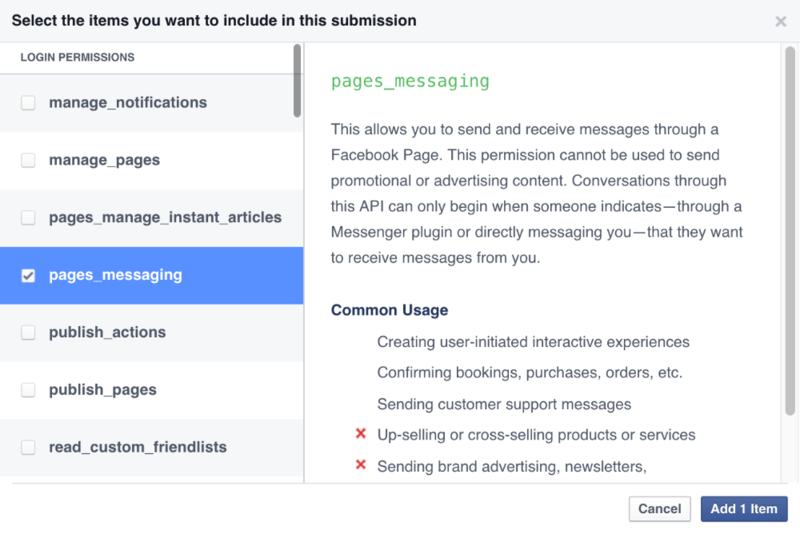 Note that each new Messenger Bot is subject to an internal review process; use the information in this link to ensure your content is acceptable per Facebook's approval criteria. Navigate to the ‘App Review’ tab and click ‘Start a Submission’. Select ‘pages_messaging’ from the list on the lefthand side of the dialog and continue. Once you've selected the 'items' you'd like to add, click the 'edit' links next to them to fill out their corresponding forms. Finally, click 'Submit for Review' to complete the submission process. The Messenger Platform is intended for customer-initiated interactions. As such, Facebook Messenger doesn't allow you to reach Facebook contacts without them contacting you first. Your contacts can reach you via your Page, or search for your Bot via the Messenger app. Facebook uses unique contact ids per page, so you won't be able to access contacts you talked to previously on a Facebook page with a new page. For this reason, we recommend assigning one Facebook page to each Messenger app (Facebook channel) connected to your TextIt account. Until your app is approved by Facebook, only admins will be allowed to message your app (even if you've made it 'public' prior to approval). Questions? Comments? Let us know; we love hearing from you. I have stuck in the step "Submitting your app" you described. Which items do I have to add and do I need to upload screenshots? I am troubling with these steps. Can you describe more details? Hey Soe, Facebook requires (1) a screencast of your app being used and (2) a description of your use case(s). Feel free to submit a ticket (support@textit.in) if the issue persists. Hey Vern, not yet–but certainly something we plan to look into this year. Is it possible to integrate FB messenger features such persistent menus (https://developers.facebook.com/docs/messenger-...)?